Historically, societies have always been located near water sources, largely because water enables efficient transport. At various stages in the history of economic growth, waterways have helped create economic wealth. During the colonial period, at the recorded peak in 1877, as many as 180,000 country cargo boats were registered at Kolkata, 124,000 at Hooghly and 62,000 at Patna. The fleet strength today is not even worth mentioning, which for information’s sake is probably about 500. Government is Commeted to develop this cheaper and greener mode of transportation. However, most of the goods still travel by congested road and rail networks, slowing the movement of cargo, adding to uncertainties, and increasing the costs of trade. So much so that logistics costs in India are estimated to account for as much as 18 percent of the country’s GDP. India has an extensive network of inland waterways in the form of rivers, canals, backwaters and creeks. The total navigable length is 14,500 km, out of which about 5200 km of the river and 4000 km of canals can be used by mechanised crafts. Freight transportation by waterways is highly under-utilised in India compared to other large countries and geographic areas like the United States, China and the European Union. The total cargo moved (in tonne kilometres) by the inland waterway was just 0.1% of the total inland traffic in India, compared to the 21% figure for United States. Cargo transportation in an organised manner is confined to a few waterways in Goa, West Bengal, Assam ,and Kerala. Inland Waterways Authority of India ("IWAI"), a statutory authority constituted under the Inland Waterways Authority of India Act, 1985, which is inter alia responsible for infrastructure development and maintenance works on national waterways, had designated 5 waterways totalling 4382 kilometres as National Waterways with a view to improve navigability in India. IWAI has been successful in attracting some private sector investment in inland water transport through Joint Venture route, one of them being the Vivada Inland Waterways Ltd which is mainly controlled from Kolkata. The National Waterways Act, 2016 was recently enacted in order to amend the Inland Waterways Authority of India Act, 1985. The amendments have added 106 additional inland waterways as the national waterways, thereby increasing the total number of national waterways to 111 from existing five national waterways. Further, the Act of 2016 has also repealed the five statutes (dealing with five notified National Waterways) that separately dealt with the existing 5 national waterways and has included the same within the new Act. The pronouncement of additional national waterways would be of assistance in major overhaul of the movement of goods and passengers by way of rivers around the country. Since many Indian cities are connected by rivers, development and promotion of river cruises connecting heritable sites is one of the ways to enhance the potential of rivers plying throughout the country. In fact, there has been a welcome development in this regard. A river cruise vessel named 'M.V. Mahabaahu' is being operated on the river Brahmaputra. Further, the Champions Yacht Club has recently introduced a river cruise named 'Tanvi' on the river Krishna with a view to boost the cruise tourism industry. After declaring 111 national waterways, including the 5 national waterways declared earlier has been enforced w.e.f. 12th April, 2016. The process for preparation of techno economic feasibility (TEF) study/Detailed Project Report (DPR) of new national waterways was initiated. As per the feasibility reports received so far, 32 new national waterways and five national waterways declared earlier are to be developed in the next three years. Out of these 32 new national waterways, DPRs for 8 waterways are available. The process for preparation of DPR has been initiated for the remaining 24 waterways. 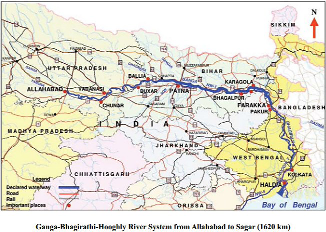 Based on the available DPRs, development work of river Barak (NW -16) has been initiated for fairway development and navigational aids for the stretch Silchar – Bhanga (70 km) proposed under phase – I. Jal Marg Vikas Project - Project for capacity augmentation of National Waterway - 1 (River Ganga) from Haldia to Varanasi (Phase -I) by facilitating navigation of 1500-2000T Ships. The project envisages various sub-projects such as fairway development, navigational aids, construction of multi-modal terminals at Varanasi, Sahibganj and Haldia, construction of new navigational lock at Farakka, bank protection work, LNG vessels etc. Project has been commissioned with the technical and financial assistance of World Bank at an estimated cost of Rs.5639 cr. The status of development of sub-projects is as below: a) Multi-modal Terminal at Varanasi Work order for construction of Phase-I (A), mainly offshore work was awarded at a cost of Rs. 169.70 cr. on 13.05.2016 and the work has commenced. Work is scheduled to be completed in 26 months. b) Multimodal Terminal at Sahibganj Work for construction of Phase-I of the Terminal has been awarded at a cost of Rs. 280.90 on 27.10.2016. The work is scheduled to be completed in 30 months. c) Construction of New Navigational Lock at Farakka Tender process has been completed and the work has been awarded cr. on 15.11.2016 at a cost of Rs. 359.19 cr. The work is scheduled to be completed in 30 months. d) Multimodal Terminal at Haldia. 61 acres of land in the Haldia Dock Complex has been taken on 30 year lease from Kolkata Port Trust. Tender process for Phase-I of the terminal is in the advanced stage. The work is scheduled to be completed in 30 months from the date of award of work. Where large shoals and islands exist, temporary structures made of natural materials such as bamboo will be erected to channelize the water flow. These temporary structures – or ‘bandals’ as they are known – will be especially erected near aquatic sanctuaries to protect the Ganga’s diverse fauna. Contracts will also be tailored to reduce the need for dredging. lIn other areas that are known to be the habitat of valued aquatic species, no dredging will be allowed in the breeding and spawning seasons. lThe speed of barges travelling along the protected areas of the sanctuaries will be restricted to 5km per hour. lAll vessels plying on the Ganga will be fitted with noise control and animal exclusion devices so that aquatic life is not unduly disturbed. lAll vessels will also have to comply with `zero discharge’ standards to prevent solid or liquid waste from flowing into the river and affecting its biodiversity. The inland waterway vessels are presently run on diesel. In an attempt to ensure the usage of environment friendly and cost effective fuel, there is widespread and urgent need to adopt compressed natural gas (CNG) as a fuel for inland waterway vessels. However, prior to suggesting any shift in the fuel, it would be necessary to set up adequate CNG pump stations in areas where CNG use for vehicles is not in vogue. While setting up CNG pump stations, the financial viability of such pump stations would also have to be considered. Efforts are also underway to provide a secure environment for the terminals and cruises, with a view to provide safe and secure movement of tourists, check illegal transportation of goods, etc. along the riverbanks which is matter of concern for respective state governments. For instance, Government of Bihar has notified certain river thanas / police stations on the banks of the river Ganga. The development of facilities like restaurants, hotels along riverside requires certain short, medium and long term planning in order to ensure adequate sewerage, water, power, terminal, refuelling, waste and effluent treatment and other services and amenities such that the developments are environmentally friendly yet economically viable. Planning should include environment-friendly measures such sewage and effluent treatment plant, waste treatment, storm water drains, rain water harvesting system and other waste management systems. While earmarking such areas for development, the government will have to change its approach from construction first and infrastructure later to infrastructure first and construction to follow. Any well planned development would not only be environmentally sustainable but would also attract greater investments as well as users. Considering all the aforesaid concerns, it can be concluded that the potential of navigable waterways and shore side and river services needs to be widened as a complementary and environmentally sustainable mode of transport, tourism and recreation. The development and regulation of waterways and river services should be critically examined and the concerned authorities should do away with all the anomalies that have obstructed the evolution and expansion of the sector. To conclude, as the economy getting increasingly integrated and globalised, and infrastructure development being a key area, inland waterways will become critical to trade and growth. The recent National Waterways Act which has 111 inland rivers and channels as national waterways, up from six is a promising step in that direction. A quick perusal of the list of 111 national waterways shows immense opportunities for transboundary and regional cooperation, as has been the case in the areas of motor vehicles and power. This could result in substantial savings for the importers — countries such as Bangladesh and Nepal. If the claims of reduced greenhouse gas (GHG) emissions turn into reality, it could enable India to take the leadership role in South Asia in meeting the global climate change mitigation-related challenges. After all, the European Union was able to achieve its target of reduction GHG emissions in the transport sector through increased use of short sea shipping technique on its waterways. Given the fairly nascent stage of inland water transport in India (and also South Asia), innovations could be pursued in developing energy efficient shipping options that also emit reduced GHGs (such as those running on natural gas). Finally it is estimated that 1.8 lakh persons would be provided employment in the Inland Waterways Transport (IWT) sector in the next five years as per the government of India. New employment opportunities are expected to be generated for operation and management of fairway, terminals, aids to navigation, barges, training and other areas.